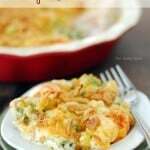 Creamy Vegetable Casserole is a classic holiday dinner recipe! 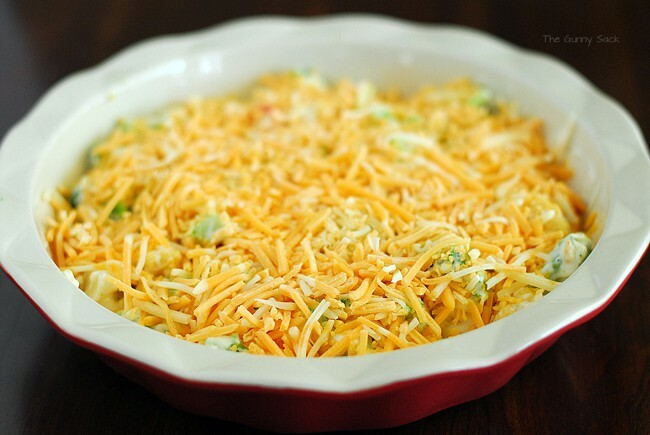 This cheesy side dish is easy to make and everyone loves it. The veggie casserole has mixed vegetables coated in a creamy sauce, topped with melted cheese and crunchy French fried onions! My sister-in-law, Bev, is a wonderful cook! Everything she makes is delicious and she makes it look effortless. Every time we have a family get together, she brings another mouthwatering dessert or some tasty casserole. And was lucky enough to go to Thanksgiving at her house this year! Two of my favorite dishes at the Thanksgiving dinner were the sweet potato casserole (whipped sweet potatoes topped with brown sugar and pecans) and the vegetable bake, both of which were made by Bev! She first brought her veggie bake a few years ago and now we always ask that she bring it to holiday dinners. Finally, I had to ask her for the recipe and after making a couple of small changes, here is my Creamy Veggie Casserole. Cook the frozen mixed vegetables according to the instructions on the package. Put the veggies in a greased casserole dish and set aside. I used a deep dish 9-inch pie pan. Whisk butter, flour, and diced onion while cooking it over medium-low heat until it is light brown, for about 3 minutes. Add milk, salt and pepper continue whisking over medium-low heat until thickened. Add cream cheese (I used the garden veggie flavor) and stir until smooth. Pour the cream sauce over the cooked veggies. Gently mix until the veggies are coated. Bake the vegetable casserole at 350˚F for 25 minutes. 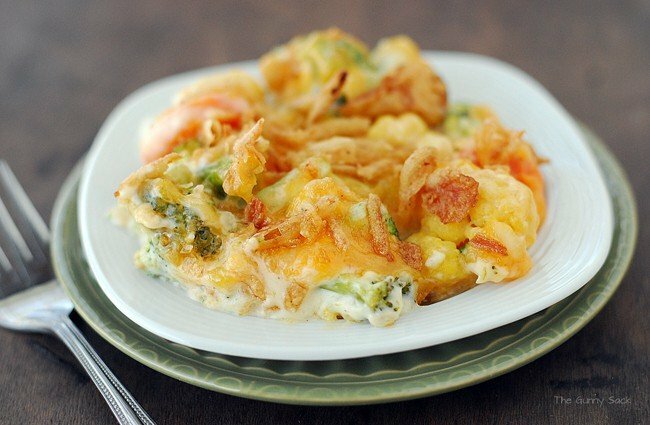 Top with French fried onions and bake for an additional 5 minutes. 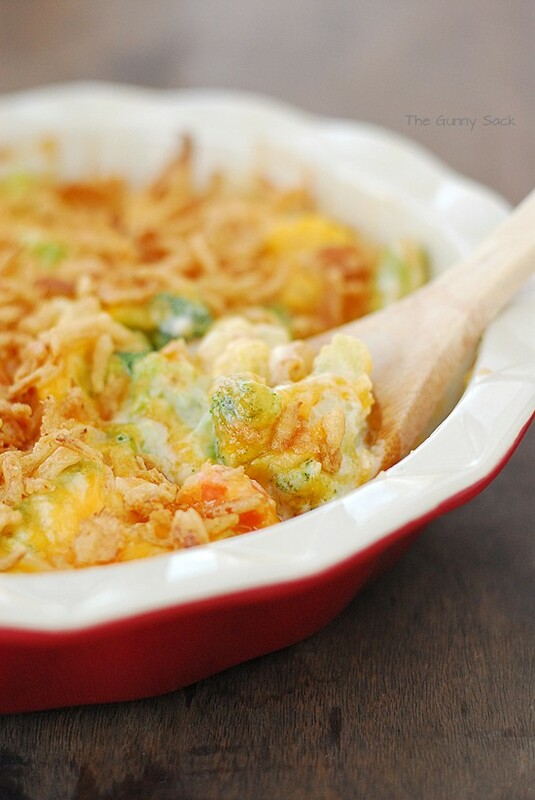 This Creamy Vegetable Casserole is a fabulous way to eat veggies and a MUST at all of our holiday dinners. 1. Can I use fresh vegetables instead of frozen? Yes! One 12 oz bag of frozen vegetables has 4 cups of cut up broccoli, cauliflower, and carrots in it. So you would need 8 cups of cut of vegetables. Cook them before adding the cream sauce (like with the frozen veggies) to ensure they are tender once the casserole is finished baking. 2. I’m making this for a crowd and wondering if it can be doubled? When making this for large family holiday dinners, I double the recipe it and put it into a 9×13 inch pan. 3. Can I make this a few hours ahead of time and keep in the fridge until ready to bake? Yes, but you will need to add several minutes to the baking time since the veggies and cream sauce will be cold. 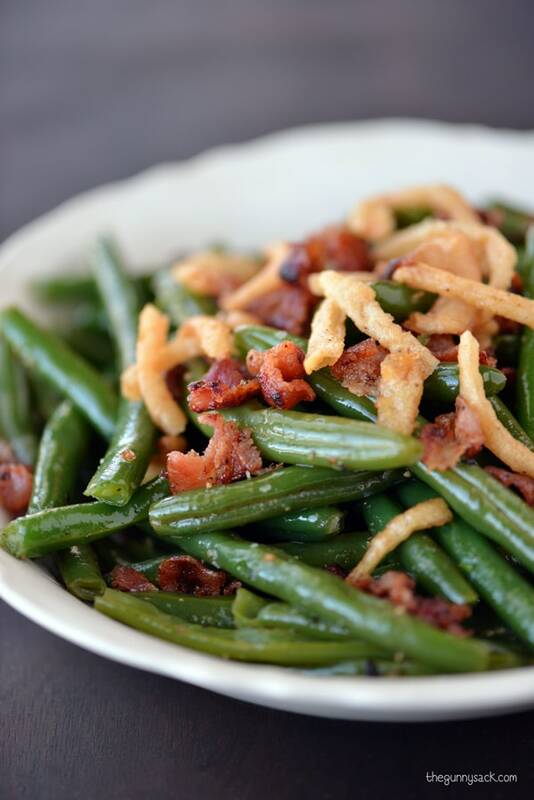 Cook until everything is hot and bubbly, then add the French fried onions and bake an extra 5 minutes. 4. How can I make this vegetable casserole a little healthier? I would try using low-fat cream cheese. 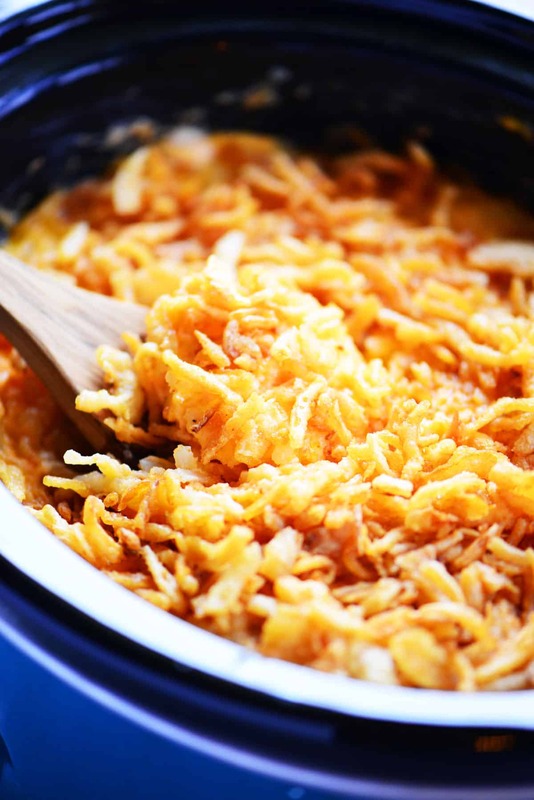 Skip the shredded cheddar cheese or substitute low-fat cheese. And skip the French fried onions. You could also try adding less of the cream sauce to the veggies. Cook veggies and pour into a greased casserole dish (I used a deep 9-inch pie pan). 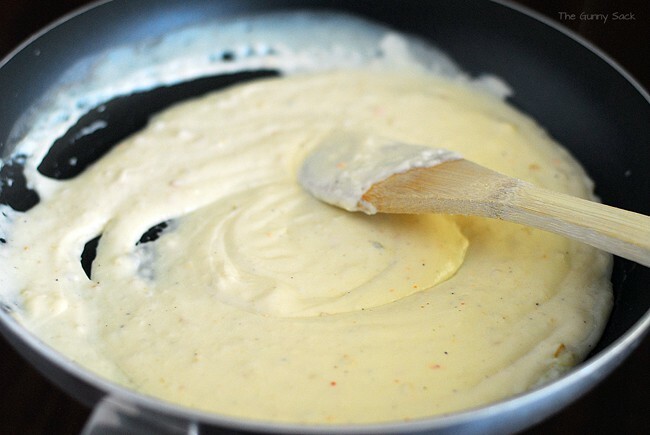 While the vegetables are cooking, make the cream sauce. Whisk butter, flour, and diced onion while cooking it over medium-low heat until it is light brown, for about 3 minutes. Add milk, salt and pepper continue whisking over medium-low heat until thickened. Add cream cheese and stir until smooth. 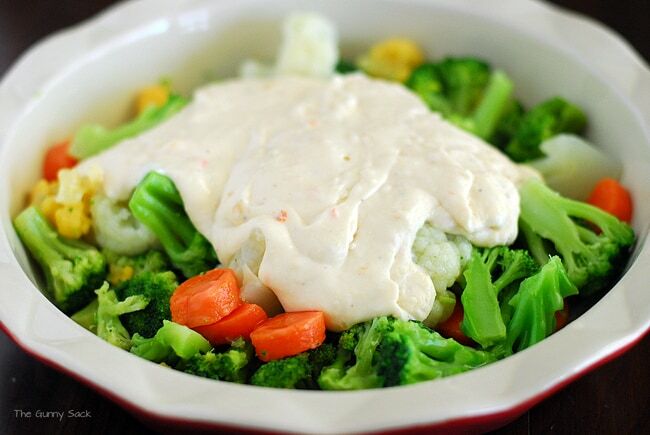 Pour cream sauce over veggies. Gently mix until the veggies are coated. Sprinkle with cheddar cheese and bake at 350˚F for 25 minutes. Sprinkle French fried onions on top and bake another 5 minutes. I LOVE this recipe and make it frequently! Do you happen know the calorie count per serving? I’ve been searching for this recipe for years; had it-lost it. Thanks. Note: It is still delish without the onion toppings. How many people will 2 12oz bags serve? This recipe would serve about 12 people, depending on what size servings everyone takes. Enjoy! Can I make this a few hours ahead of time and keep in the fridge until ready to bake? Yes, but you will need to add several minutes to the baking time since the veggies and cream sauce will be cold. 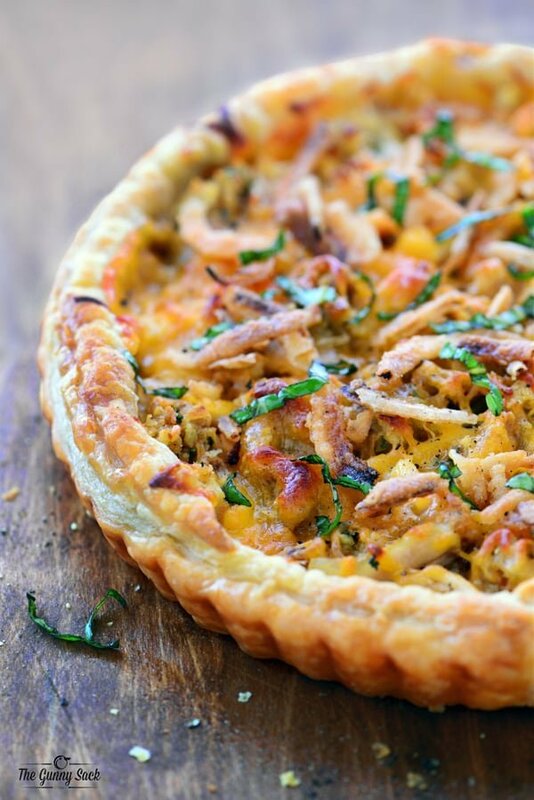 Cook until everything is hot and bubbly, then add the French fried onions and bake an extra 5 minutes.t! Making this tonight! Sounds yum -one question! A teaspoon of diced onion?? Dried??? Yes, I used the dried/dehydrated kind but you can use fresh chopped onion if your family prefers that! Happy cooking! 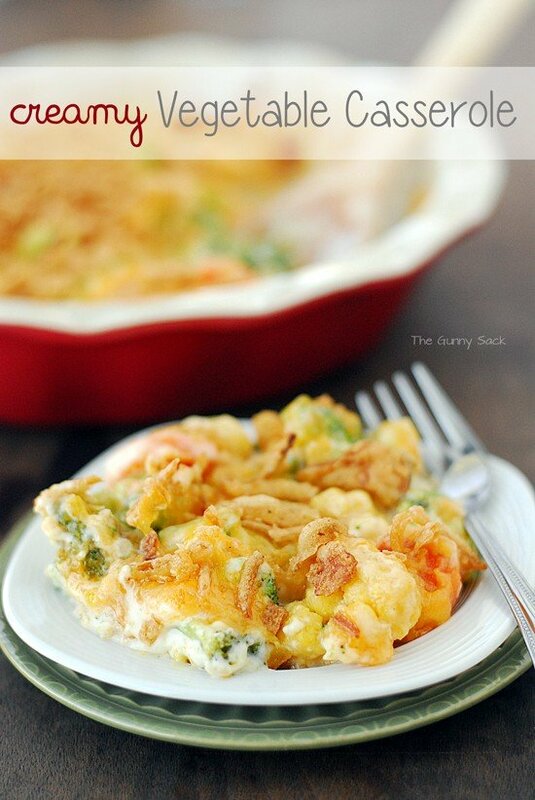 The Veggie Casserole looks awesome. I shared it with almost every one on my Facebook list & I will e-mail it to those not on Facebook. I’m going to ask my daughter if she will make it ether for Christmas Dinner or for New Years.